The image below has been floating around Tumblr for a while. I’m not really sure where it came from, what the context was or any of its history (if you know anything about it, please comment and fill me in). At the urging of one of my friends ShackleKid of Ireland I am attempting to remake this image, but perhaps with a more artistic interpretation. I am starting off with a raw remake just to get a feel for the image, but I want to eventually remake it in my own style with some of the attitude/feeling that I like to put into my work. One of the problems I have with the image is understanding it. The key interpretation I have always seen is that it represents a slave’s uniform waiting for it either prior to a weekend of service or perhaps even the day it fully surrenders to being a full time slave. The original has a very domestic feel to it, which doesn’t really pair with the boots depicted. The carpet and the beige wall with the deep depth of field gives it a suburban feeling, like the slave will be serving in a house that may have kids playing next door, which isn’t exactly the type of feeling I want to get from the image. 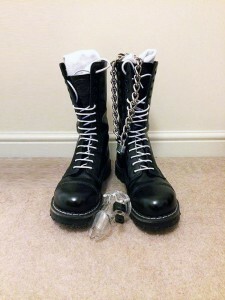 The boots suggest a certain situational severity, but yet the thin chain collar and acrylic chastity device are very much weekend (or afternoon) play gear. With this choice of boot I would like a more ominous feel, something a little darker. The original image reads almost cozy to me. Perhaps I just like to render things in my fetish as dark and mysterious, that may be the lens through which I am giving the original such harsh critique, but it is my interpretation. For my recreation project I am going to accept the boots as the central component of the image as it is the most pronounced and most visually obvious. I am going to play around that theme for now with my attempts, but I may eventually attempt it with basic work boots or perhaps even something like basketball sneakers to give it a completely different feel (perhaps a jock slave). I am also considering playing with the environment somewhat, using a backdrop of brick or even an outdoor setting to give the image a more exposed and vulnerable feel. I very much like what you have done so far. Not only are your Boots shinier, but so is your hardware. I also like the severity more apparent in yours: the collar has the flat, welded links instead of twisted, split links. Of course the chastity device is steel rather than plastic. I even the hard wood makes it more severe, as you mention. The only thing different that I would do, is my slave would have a padlock similar to that of the original, but BIGGER and heavier. I look forward to where this project goes.